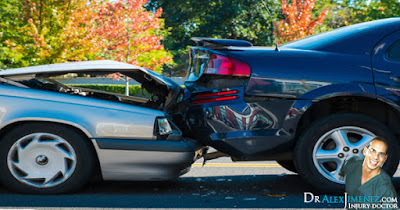 Whiplash type injuries occur more frequently during rear-end collisions as the force from the impact jolts the head and neck in a back-and-forth motion in any direction. Symptoms of whiplash usually appear within 24 hours of the accident and may include symptoms of pain, stiffness on the neck, headaches, dizziness, blurred vision, and fatigue. In rare cases, an individual with whiplash-associated disorders may also experience difficulty concentrating, memory problems, ringing in the ears, difficulty sleeping, and irritability. Because the discs absorb a large part of the impact to the spine, a herniated disc is a possible complication that can occur during an auto accident. A disc is herniated when its soft center pushes through a small crack in the disc’s exterior, causing irritation around the nerves. Several people may experience no symptoms from a herniated disc while others may commonly experience symptoms of arm or leg pain, tingling, numbness, or weakness depending on the location of the herniated disc. Compression fractures commonly occur in the thoracic, or middle, and lumbar, or lower, regions of the spine during an auto accident. As a result of the force from the impact, the upper body may be thrown forward while the lower body remains in place by a seatbelt, causing the vertebrae to pull apart. Spinal fractures can occasionally result in spinal cord injuries due to the broken vertebrae moving out of place. The main symptom of a spinal fracture includes moderate to severe back pain that can worsen through movement and those with spinal cord injuries may experience symptoms of tingling, numbness, weakness, and loss of bladder or bowel control. Spondylolisthesis occurs when the vertebra moves out of place as a result of a stress fracture on the bone. The abnormal placement of the bone can cause compression on the nerves or spinal canal, causing symptoms of pain, numbness, and/or weakness in the buttock or leg which can lead to walking complications. In severe cases, spondylolisthesis can cause loss of bladder or bower control. Many times, individuals may experience no symptoms from the condition until several years’ post-injury. 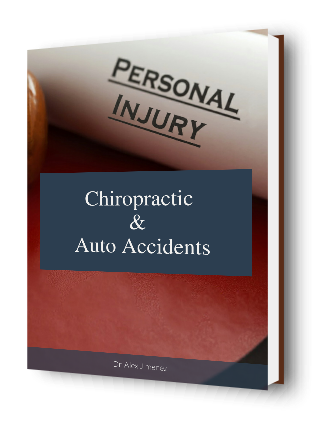 After being involved in an automobile accident, it can be difficult to determine the presence of neck or back pain as a simple muscle strain or a more serious injury. It’s important to seek immediate medical attention to properly diagnose any for possible spinal damage. A chiropractor specializes on musculoskeletal injuries involving the spine as well as other structures of the body. A doctor of chiropractic, or DC, can diagnose an individual for the underlying cause of pain and other symptoms as some symptoms may suggest that medical help is needed.